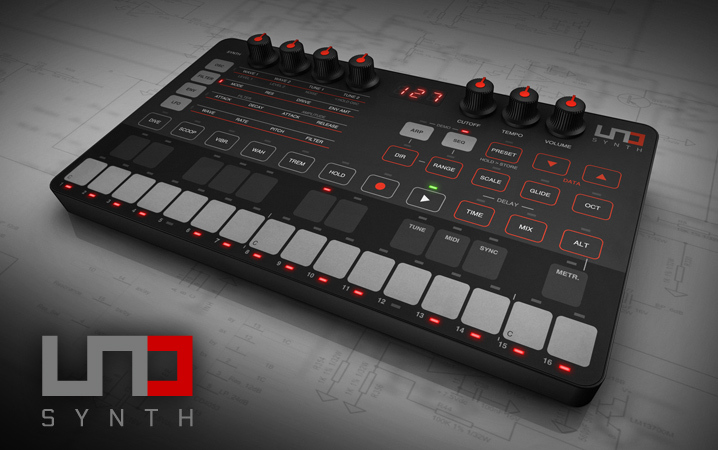 UNO Synth by IK Multimedia is . 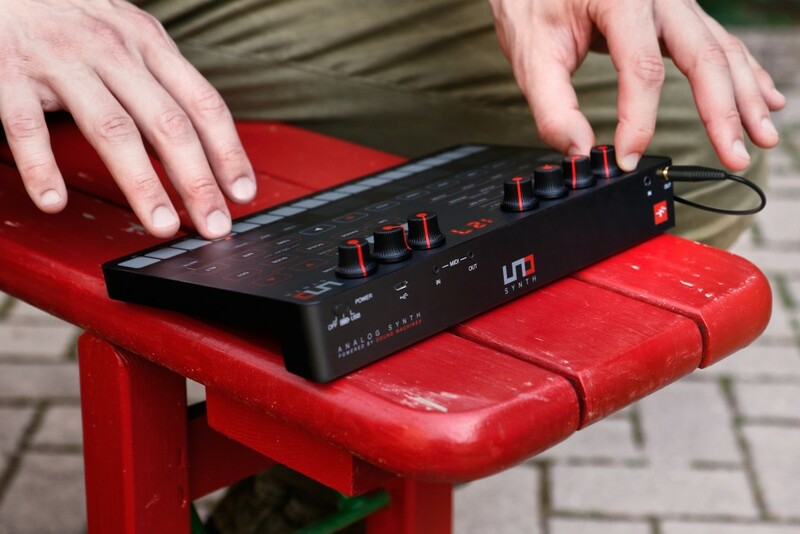 UNO Synth is the ultimate portable, monophonic, true analog synthesizer and IK Multimedia's entry in the hardware synthesizer world. 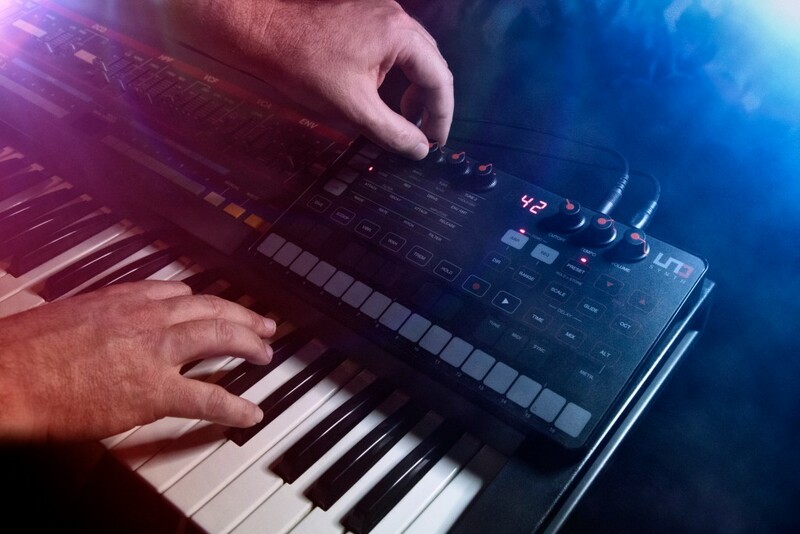 We combined our two decades of experience in software and hardware development with the expertise of Italian boutique synth-maker Soundmachines and IK's synth guru, Erik Norlander (one of the brains behind acclaimed synths like the Alesis Andromeda). 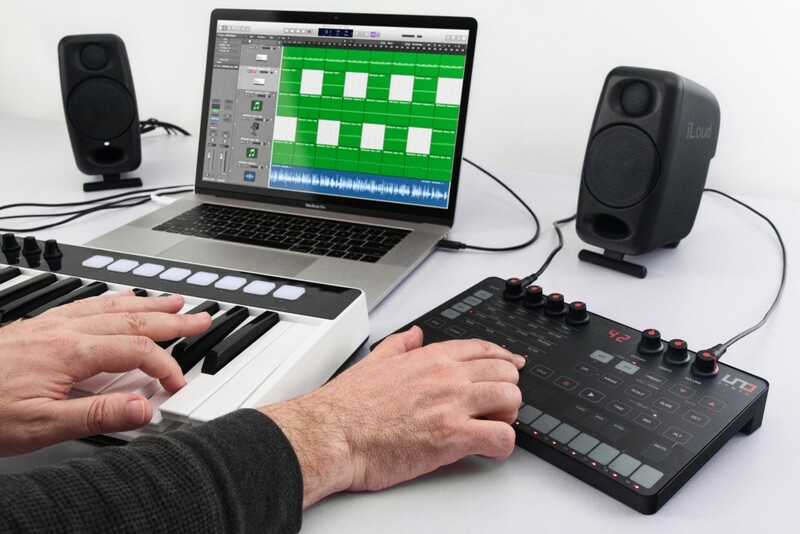 The result is a no-compromise instrument with massive analog sound that's also easy to use with hands-on programmability and advanced features at an unbeatable price. All-analog audio path with 2 VCOs, noise generator, resonant multimode VCF and VCA. 2 independent VCOs with Saw, Triangle, Pulse waveforms with continuously variable shape including PWM of the square wave plus a separate white noise generator. A 2-pole OTA-based analog resonant sweepable multimode filter with LPF, HPF and BPF. Custom-designed, dual-stage overdrive that provides filter input overdrive for classic synth saturation tone, from subtle warming to aggressive distortion. LFO with Sine, Triangle, Square, Up Saw, Down Saw, Random and Sample-and-Hold to modulate Pitch, Filter, Amp and continuous oscillator wave shapes including PWM. 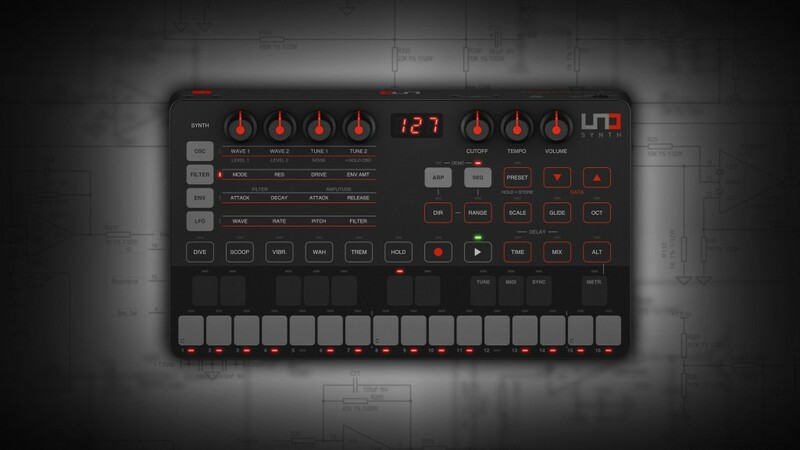 Uno Synth is amazing for the price. Even if it cost twice as much, it would still be a decent buy but for $200 it is ridiculously good. 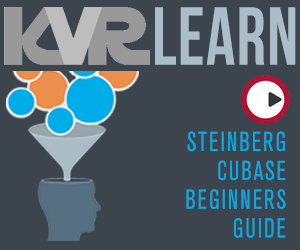 You can read about the features anywhere so I'll talk about the practical experience of using it. The layout is very easy to work with, even if a few of the choices seem a bit strange. e.g. you get a knob for cutoff but not for resonance. The parameter matrix on the left side of the panel works as well as any, although I don't know why they didn't split the envelope line, like they did with the oscillators, so that you could edit both envelopes fully from the front panel. These are relatively minor things, though, because the fact is that it sounds so good that you'll be happy to put up with a few little issues. Both oscillators are the same and the way they have set up the tuning parameter is very clever - you get fine tuning, in cents, just off-centre but as you turn the knob further, it starts to jump in semi-tones. You need to keep one oscillator at the root pitch if you want to detune between them but that seems a small price to pay for the convenience of a single tuning knob. The front panel only gives you access to the basic oscillator settings but you can delve deeper using the software editor (more on that in a minute). Once you get a bit of movement into the sound - via PWM or by modulating the wave shapes, which morph smoothly from one shape to the next - you can make some really fat timbres that sound like they've got a few extra unison voices stacked on them. It's very, very impressive. The filter does it's job well enough without being particularly noteworthy. It's the oscillators that really make this machine shine. With Low-, Band- and High-Pass modes it offers plenty of versatility. There is also a delay built-in, which is handy for beefing up the sound a bit. Uno has a row of "effects" buttons you can press to get vibrato, tremolo, etc. They only work while you are holding them down and, to be honest, I don't see much value in them. OTOH, both the arpeggiator and the sequencer are very handy. The arpeggiator is just what you'd expect, with a lot of different patterns to choose from. The sequencer is limited to 16 steps and the settings are stored with each patch. 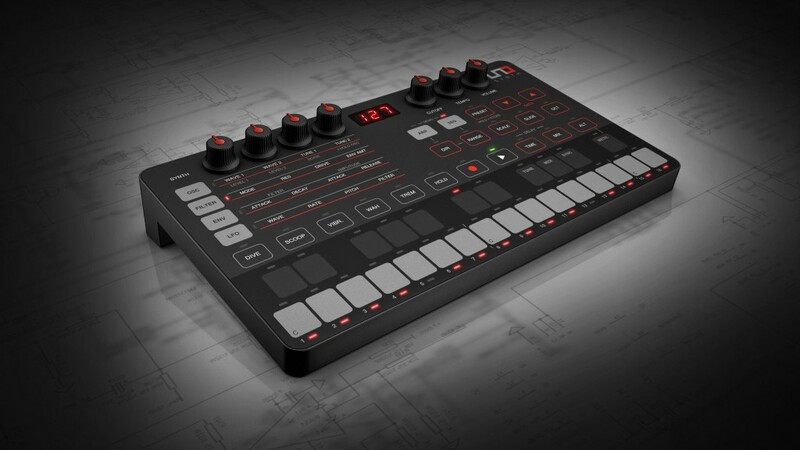 You can record in realtime (there is a metronome) or step time and you can add parameter changes to each step, like Elektron's P-locks or Korg's motion sequences. That makes the sequencer pretty powerful and something you might end up using more than you think you will. The 27 key keyboard is a lot of fun to play with, way moreso than I expected. Sliding your fingers around a flat panel is a hoot. It would be even better if we could make the envelopes retrigger on each new note but the default behaviour is they don't when you play legato. You can also use Uno as a MIDI controller, either via USB or MIDI. I've used it to control both softsynths on my PC and other hardware instruments and it does a decent job. Even though Uno is monophonic, the keyboard isn't so you can play chords on other instruments. The software editor is available as a standalone for PC, Mac and iOS and as a VSTi for PC and Mac. 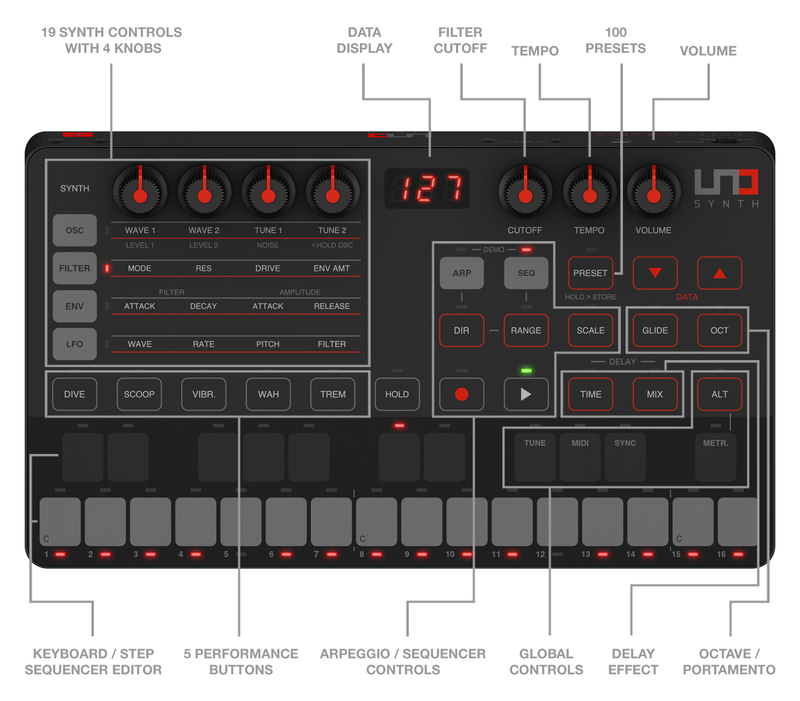 It gives you full access to all the synths parameters, expanding the synth's palette considerably. You can set the depth/levels of the "effects" buttons, add PWM and waveshape modulation to the oscillators and assign things to the mod wheel. It also lets you put names to the presets, so you can remember which preset does what. If you don't want to use the editor full-time, it's easy enough to set up presets with PWM and/or waveshape modulation already dialed in and work from there. You get 100 presets but 1-20 can't be overwritten, so you only get 80 user slots. So far I've only used half-a-dozen so I think 80 is plenty. I bought Uno mostly because it was cheap but after six weeks or so with it, I think I'd still want one if it was $500. It's easy to use, it has enough features to keep you interested for a while and, above all, it sounds great. 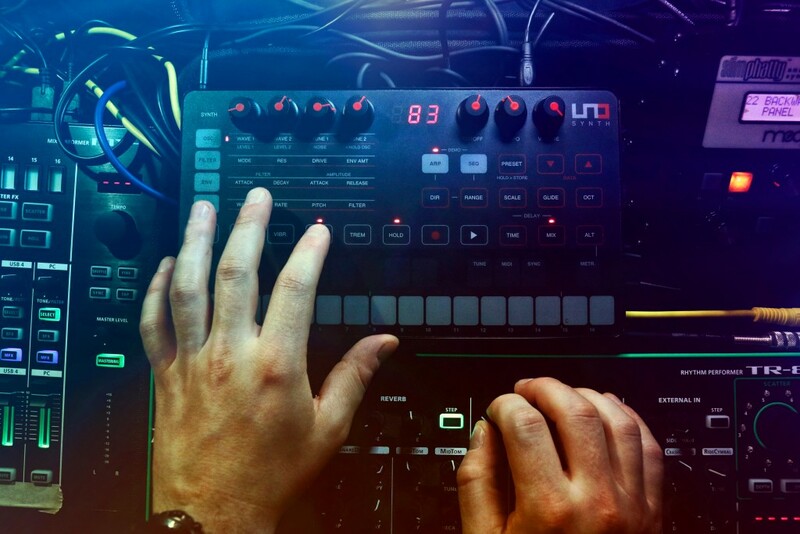 It has, for example, kept me entertained for much longer than MicroMonsta did and I'd probably have it over either a Korg Minilogue or Monologue. I'd definitely have it over any of Roland's vintage Boutique boxes (but not necessarily over the SE-02).